The Osteopathic National Center for Orthopedic Research (ONCOR)! ONCOR: Entering into relatively uncharted territory requires investment, and an alliance between academic research and clinical specialists. It demands a keen interest in discovering the best orthopedic practices and ensuring excellent patient outcomes. In 2007, ONCOR brought a new clinical research focus to McLaren Greater Lansing Orthopedic Hospital. ONCOR can be attributed to the groundbreaking efforts of Lawrence Mysliwiec D.O., ONCOR's medical director. Dr. Mysliwiec has more than 20 years' experience as a spine surgeon and a medical school professor. He is Chief of Orthopedics at MSU's College of Osteopathic Medicine, and Director of McLaren Greater Lansing's orthopedic residency program. "McLaren, in case people forgot," says Dr. Mysliwiec, "did the first arthroscopic procedure in North America. McLaren Gretaer Lansing had a tradition for great orthopedics even before McLaren Orthopedic Hospital on the Pennsylvania campus opened as a Center of Excellence. At McLaren Orthopedic Hospital, there are eight operating rooms dedicated solely to orthopedic surgery. Both inpatient and outpatient surgeries are done in a broad scope of orthopedic subspecialties. "We have almost 20 full-time clinical and residency faculty, who are part of MSU's College of Osteopathic Medicine. McLaren's Orthopedic Department has grown to about 40 members. We have 20 MSU/McLaren Greater Lansing orthopedic interns and residents, shared with Sparrow Hospital, in one of the most competitive residencies in the country. McLaren Greater Lansing residency graduates now are competing successfully for some of the most prestigious sub-specialty fellowships in the nation. Many of these graduates will return to teach in our program, which continues to grow in both size and stature. "The missing piece for ultimately establishing the hospital as a true center of excellence was a vibrant research program, staffed by university scientists, involving busy practicing orthopedic surgeons and the residents, who each complete a publishable research project, as part of their five years of training. With a substantial five-year grant from McLaren Greater Lansing Foundation, along with monies directly from McLaren Greater Lansing, the hospital converted almost 10,000 square-feet into research labs, offices, a conference room and library that houses ONCOR. 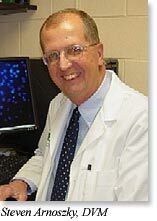 To lead the research program MSU College of Osteopathic Medicine recruitedand hire one of the top orthopedic researchers in the country --Jacek Cholewicki, Ph.D., from Yale University. He hs joined the MSU faculty, and concurrently has set up shop in the McLaren Orthopedic Research Pavilion as McLaren Greater Lansing's Distinguished Research Scientist . ONCOR receives support from the American Osteopathic Academy of Orthopedics (AOAO) for its research advisory board. This Board guides research efforts nationally throughout 29 AOA orthopedic residency programs. Among the scientists on that board is Steven Arnoczky, DVM, who is the Wade O. Brinker Endowed Professor of Surgery, and director of the Laboratory for Comparative Orthopedic Research at MSU's College of Veterinary Medicine. Dr. Arnoczky is known worldwide for his research on the injury, healing, and repair of ligaments, tendons and menisci. Dr. Arnoczky and his lab have provided the basic science rationale for the repair of torn menisci, a very common knee injury. "By identifying the extent of the blood supply to the meniscus and its role in says Dr. Arnoszky, "we have been able to provide surgeons with the rationale for repairing these important structures." Dr. Arnoczky has also developed techniques for preserving cadaver menisci for transplantation. "Being able to replace a severely damaged meniscus with an allograft can also lessen the severity of osteoarthritis that had been associated with the removal of a damaged meniscus." Roger Haut, Ph.D., of the MSU Orthopedic Biomechanics Laboratory and Professor in the Department of Mechanical Engineering, is interested in fall-related injuries among older adults. He and his team are exploring task-specific training in controlling the body's trunk to avoid falling. Another facet of his research is testing the strength, stability, stiffness and durability of different kinds of shoes. His lab is well known in the world of shoe manufacturing. "We can tell you," says Dr. Haut, "what happens when you put a person of a certain height and weight into a particular shoe." MSU"“COM's Associate Professor Laura McCabe, Ph.D., is a bone physiologist. "Osteoporosis," says Dr. McCabe, "can occur with aging, as well as space flight and diseases such as Type 1 diabetes. Decreased bone density is a major risk factor for fractures and extended bone healing time. We are examining the cellular and molecular mechanisms regulating bone formation, by using a variety of approaches, including cell and human studies. "Once we know the causes of suppressed bone formation, we can develop specific treatments to increase bone mass and healing in the elderly, astronauts and diabetics. ONCOR is great because is allows us to apply our basic research knowledge to clinical problems." "These type of research scientists." concludes Dr. Mysliwiec, "will work with MSU/McLaren Greater Lansing surgeons from nine different orthopedic subspecialties to study and apply their expertise to the down-to-earth problems that our patients face." A final note from Dr. Mysliwiec: "The application of an osteopathic philosophy to the world of orthopedic research should prove attractive to healthcare providers, patients, and organizations like the National Institutes of Health and the Center for Disease Control, as well as private organizations and foundations. "Research is uniquely focused on complementary roles of alternative physical medicine and surgery, learning the limitations of conservative treatment, and refining the indications for surgery. We intend to improve surgical outcomes, devise less invasive operations, and develop new biotechnologies. These are all research-proven applications that should help reduce growing medical costs through less frequent surgery, lower surgical morbidity, and better functional outcomes that lead to healthier patients. "Parameters to initially measure the growth of ONCOR in 2007-8 will be the number of new projects begun, the number of publications for our research, and the growing support of gifts and grants to support the work. "Due to ONCOR's presence on the McLaren Greater Lansing campus, patients can come to McLaren Orthopedic Hospital, confident that we are trying to do their orthopedic surgery in the very best way, with the best possible outcome. You should expect the same level of excellence and expertise here, as you would at any premier orthopedic hospital. Through careful study of today's surgery, we can begin to plan tomorrow's surgery. That should be our legacy."